If you want to know what your house is really worth, you have to take a detailed look at real estate supply and demand. It's OK to rule of thumb things if you are just curious, but if you want to sell a home in 2013, you had better make a serious effort to discern where your house fits into the bigger picture of the Tallahassee real estate market. The majority of people who list their homes for the first time usually fail to get it sold, and it ends up costing them money and becoming a major inconvenience. The housing market is getting better. For me. You see, I make my living helping people sell their homes, so my primary concern is that more homes are selling (more opportunity for business). But if you own a home, you are less concerned with "how many" homes are selling, and you are more concerned with "how much" they are selling for. Right? So don't be too quick to think that the real estate market is fixed because there are reports of a better housing market this year. The fact is, home values are falling for most price ranges, and "better" is purely a subjective issue. Every month, I create a real estate supply and demand report (click on image on the right to enlarge) in order to help home sellers figure out the real estate supply and demand dynamic for their individual home. The report is a single page, and it allows you to see the competition (homes for sale in Tallahassee) for each price range in each area of the Tallahassee real estate market. 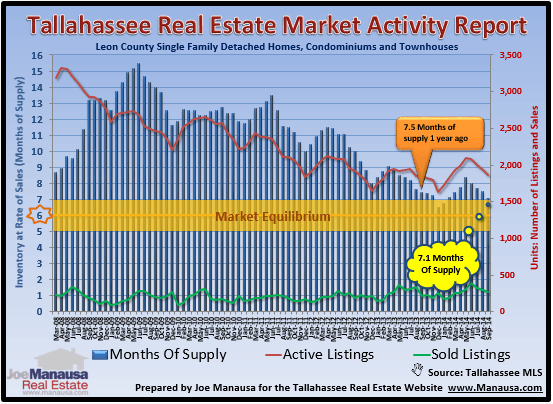 This is the perfect Tallahassee real estate supply and demand report to download to your smart device or print out to use when you are trying to determine the value of your home. Use this report to determine the strength and depth of your present and future competition, and you will be well upon your way of determining your home's value. And as always, if you want to know how the real estate supply and demand report can help you save money when you sell a home, just drop me a note and we can schedule a time to demonstrate how this relates to your specific home and situation.